In the previous article we introduced the technique of tempering the chocolate, and we learnt that time, movement and temperature unfortunately create many problems. The delicate balance that dominates this preparation often forces to make many attempts to get a great result unless you have a good mastery of the technique. We explained that if the chocolate is cooled without moving it, it solidifies very slowly, the texture becomes grainy and the colour not shiny. Time and temperature have obviously a dominant role in the process as they can prevent to get that shiny appearance that we try to give to chocolate through this technique. However, there is a way to forget about the problems of tempering the chocolate and that’s HotmixPRO of course! Thanks to its professional features designed to solve any kind of problem, HotmixPRO is also able to temper the chocolate! But he does it in its own way, and trust me, this one is much easier and efficient. Let’s see how this is possible! 1) First of all, you will be 100% sure of reaching the right temperature for the kind of chocolate you choose. This is possible through its DEGREE-BY-DEGREE temperature control! All other devices with a less precise temperature control (for example 5° increment or also 10° increment..) are not able to ensure a professional result because of a very approximal control. Especially by working with such a delicate food like chocolate, it is essential to keep a high level of accuracy to get the best result. 2) The problem of the movement is easily solved by the automatic mixing which ensures maximum shine and perfect texture through an homogeneous mixing. 3) Moreover, during the second phase in which the chocolate is melted again (the most complicated one) is possible to keep the temperature stable all the time you want thanks to the WAIT TEMPERATURE function! In this way, you can always have tempered chocolate ready to be use. It would be extremely difficult to achieve manually such a result and fresh and perfect ingredients are essential for a professional to ensure a high level of service. 4) Last but not least, by using the NEXT function is possible to leave to the machine all the work. Every step will be carried out without the need of your constant presence. This is the way to ensure the highest level of professionalism. Well now we can temper without any fear! Free your imagination and create many decorations, as we did in this video, WATCH IT HERE! Does this means anything to you? Of course yes, we all said it at least once in a lifetime, because let’s face it all, a dish served right after its preparation has a completely different and better taste. Why? Because it is possible to perfectly feel the composition of flavours and tastes that blend harmoniously together and whoever prepares the dish has difficulty in keeping it alive for time and temperature reasons. Yes, because when the temperature of a preparation reduces, some flavours take over on others leaving to customers an incomplete dish, different from what the chef had thought. Unfortunately, this is mainly due to the fact that who owns a business must absolutely prepare huge quantities in advance to meet all the demand at the right times. In fact, it would be impossible to satisfy each customer by preparing in no time all the elements of the dish if you want to optimise the use of both the raw materials and the equipment people has. To run their business better, people are obliged to use “pioneering” and unprofessional solutions that have allowed bakers, restaurants and kitchens of various kinds to overcome the lack of a suitable equipment. The market and demand needs were a problem that greatly limited the work for years and no professional solutions were specially designed for those who work constantly with the food..until now! HotmixPRO has listened to the needs and complaints of the market and provided an unprecedented and professional solution that never existed before. We are talking about HotmixPRO Dry, the first appliance able to preserve at a positive temperature and to keep the textures, flavours and tastes of your preparations unaltered for a long time and more important, with no loss of any organoleptic properties. An unprecedented worldwide innovation that combines all the benefits of static temperature conservation to the incredible advantages of a moisture-free chamber, since it is finally possible to enjoy of perfect textures by eliminating the moisture in the air. No more soft or moist texture that can lower the quality of the product. 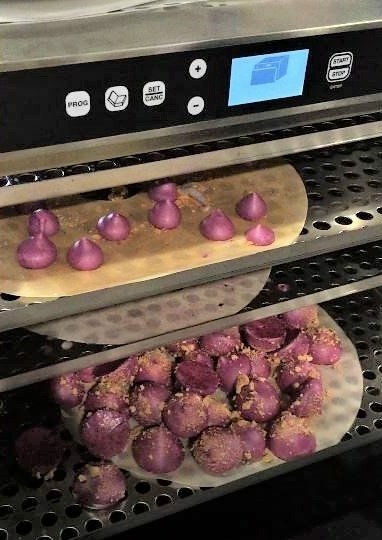 Beetroot Meringues, made in the HotmixPRO "DRY"
From now on, it will be possible to better organise the production by using an appliance able to store foods prepared in advance and preserving them without problems for many hours. And of course this will have no consequence on flavours and textures, while on the contrary it will preserve them at their best. It will be impossible for customers to distinguish a newly prepared product from a preserved one inside HotmixPRO Dry, since the differences are almost nonexistent. A true revolution if you consider the enormous benefits you can now enjoy, such as preparing large quantities in advance without the risk of a waste of product due to quality loss. You will also be able to free other appliances such as ovens that can be used for other items, increasing in this way the efficiency of your business and the entire production. If you want to become part of this new and innovative way of working, find out here all the other incredible abilities of HotmixPRO Dry: created to make your work a comfortable passion. The seventh Pura Brasa restaurant opened in Singapore its doors on June 7 , the first international opening of the chain that adds to the total of already seven franchises of Pura Brasa around the world. Pura Brasa Singapore is a spacious and modern style restaurant, with a capacity of 100 diners, located in the Tanjong Pagar Centre, a recent construction that has become the highest of the city’s impressive skyline. In the busy CBD, customer of the new restaurant delight palates with their Spanish cuisine, enhanced by the charcoal using in the Josper oven, a product 100% made in Barcelona, Spain. The open kitchen of the restaurant, like all in the chain, allows the diners to see how their dishes are cooked and prepared, and then the end result presented at their table. Enjoying the typical taste of yesteryear and the perfect texture and retained juiciness that cooking over charcoal provides. The new menu offers a great variety of dishes based on the quality of the ingredients, and after being cooked over charcoal, the quality of the ingredients shine. The brad Pura Brasa created in 2010 with the official opening of its first restaurant in the Sant Andreau neighbourhood in Barcelona. The concept of Pura Brasa was was a way of showing and putting into practice the technology of the Josper oven and all of the variety of the applications it has. What better way to showcase the Josper to our customers than to go to Pura Brasa and see what the Josper can do in a fast-paced restaurant environment. The success of the first restaurant led to the opening of new restaurants and franchises. Award-winning chef and highly sought-after consultant to the hospitality industry, Raymond Capaldi recommends HotMixPRO to any kitchen wanting to save time and money whilst increasing creativity and precision. Capaldi brings decades of experience from his time in international hotels and his own restaurants in Melbourne. Known for his ability to refine costs yet never compromise on creativity, Capaldi endorses this ingenious range of products imported by the experts at Unique Catering Products, who together help those in hospitality make a tangible difference to menus and margins. On a daily basis in his consultancy role, every business and client craves the same answers from Raymond, how can they save on labour and costs and achieve consistency every time. Now, Raymond can confidently recommend this product that will achieve the desired outcome. Equipped with a range of smart features, the HotMixPRO can perform all the tasks of a chef including cutting, blending, mixing, kneading, heating and more, allowing consistent production with minimal supervision. 1 tool, 2 accessories, 27 functions. “The HotMixPRO is the only commercial thermal mixer product on the market that increases the quality of your dishes, the efficiency in food preparation and cooking processes and performs safely and consistently under the pressure of commercial food operations of any size”, says Capaldi. Food preparations are still performed with ordinary cutters, typically capped at 3000 rpm incomparable to the 27 different speeds of HotMixPRO. The high speed (up to 16’000 rpm in some models) shortens processing times, also providing a whole new level of refinement without affecting the properties of ingredients. Complemented by an innovative heating/cooling system, HotMixPRO can cook and freeze* any kind of food, at any temperature between -24°C* and 190°C, with perfect degree-by-degree temperature control whilst mixing simultaneously. HotMixPRO perfectly maintains temperatures and mixing speeds to achieve precise results including the time-consuming balancing acts of tempering chocolate, creme anglaise, sugar boiling or for a perfect hollandaise. The award-winning machine also maintains a liquid temperature at the ideal level for poaching fish, poultry, eggs and fruit and acts as a small capacity Sous-vide, making it the ultimate tool for new trend cooking. 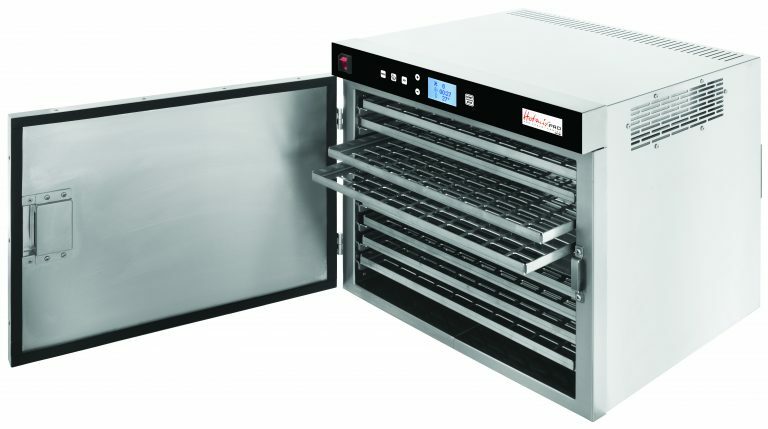 The entire HotMixPRO range with the exception of the EASY model, can be programmed to store your custom recipes on an SD card, for easy frequent use by all kitchen staff, minimising mistakes and therefore wastage. The stainless steel constructed units are portable and fit into any kitchen and is perfectly compact and portable making transport a breeze. The secure design of the clamped lid and internal thermal insulation ensures operator safety. Unique Catering Products Director Max Corazzi believes Raymond’s experience and expertise make him the perfect spokesperson for the HotMixPRO.